Whitworth amassed a whopping eighty-eight professional wins in her careera record for both men’s and women’s US Tours. Small enough to fit inside your golf bag and with much of the simple, easy-to-understand, commonsense manner of Penick’s classic books, this book includes expert advice on playing one shot at a time; thinking your way around the golf course; the common traits of all champions; the importance of confidence, concentration, and learning in practice rounds; practicing trouble shots; bad-weather golf; pressure putting; and how to turn things around when you’re playing badly. With its invaluable advice, this is an indispensable resource for any golfer. 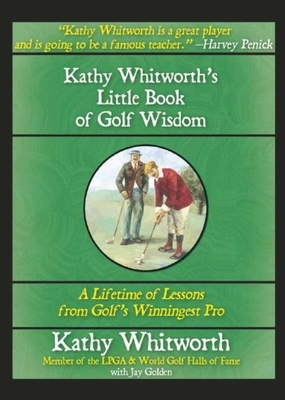 Kathy Whitworth became, in 1981, the first LPGA player to record $1 million in career earnings. Twice named the Associated Press Athlete of the Year (1965 and 1967) and named Player of the Year by the LPGA seven times in eight years, Kathy was inducted into both the LPGA and World Golf Halls of Fame in 1975. Jay Golden has written hundreds of articles for such publications as Golf Digest, Golf magazine, and Executive Golfer. A member of the PGA’s National Teaching Committee, he is the host of Golf Life, a television program currently available in sixty million homes on regional sports networks including Fox Sports and Comcast SportsNet.